Many years before, on my first visit to Australia as a visiting professor there I had a set of very bright undergraduate students whom I had to teach. Gujarat Communal riots were fresh in memory. A Vietnamese student asked me – “You come from Gujarat?” to which I said “yes”. She further asked “Wasn’t this the place where the recent violence took place?” To this I said “Yes”. Bright girl that this student was she further remarked something which was thought provoking. “How is it that in the land of Gandhi does one sees this type of violence?” I do not know if she understood what I said in my reply “Gandhi is most relevant in Gujarat”. As time has passed I have found this to be very true. Ram is most relevant and has to be born in India. Yitzhak Rabin is most relevant and has to be born in Israel and Martin Luther King is most relevant in U.S.A. It is in the most contrasting or opposite environments that apostles who epitomize sensibility become relevant. I see such a role and relevance of women in Pakistan. Two days before when I saw the film Bol, my first reaction was this doesn’t happen in India. It happens in Pakistan. I also felt happy that 64 years of democracy and independence has brought India significantly out of these dark shadows. But as I was returning home some new and very stirring ideas started evolving in my mind. The film vividly depicts the subjugation of women by one man in the name of religion. Once again under the same guise he uses double- standards and does whatever he should not do. His eldest daughter seemingly illiterate (but not uneducated!) rebels. She openly challenges the father who deeply enshrined in poverty just refuses to change his ways every time mis-quoting the religion. The girl rebels and revolts. She quotes the same tenets of the pious religion and shows how wrong her father was. Matters come to a fierce end when she is forced to kill her father to save the life of her new-born own step-sister. This is the hope for this world. In the name of a pious, gentle and holy religion which is supposed to unite and propagate peace some perverted followers have unleashed inhuman subjugation and regression of the society in Pakistan, Afghanistan and so many such countries. I know this must be happening in India too. Terrorism is an offshoot of this subjugation where these males, unchallenged, indulge in senseless killings and bloodshed all over the world. I am sure currently by and large unseen and unheard women folk of these societies are thinking. They are still in thinking state. They are bound to revolt and revolt they will. This revolt will start from Pakistan. I am very hopeful. This is because Pakistan, India and Bangladesh share a common history. Their value systems and basic thinking is nearly the same except that which is tainted by perverted wraps of religion. This is that part of the world where pioneer women leaders have emerged. 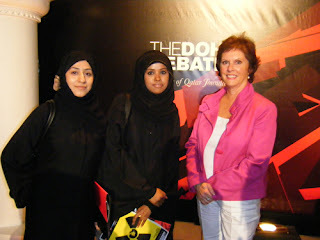 This is that part of the world where women have been playing a very important role much beyond mundane house-keeping. Historically women here have fought wars, battled oppression and bred progeny that have led the world from here. Women here have held very a high and respectable position well before women is the so called developed and progressive societies have done. These women cannot be subjugated easily and for long. The fear of God and religion is basic to human beings. Misusing this vulnerability men are having a field day ruling the roost and literally shooting unhindered. 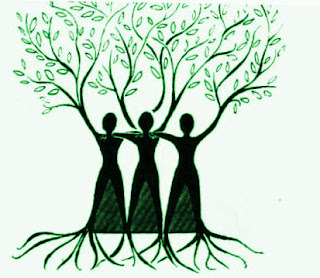 Women of Pakistan in particular as it is the fountain head of terrorism are bound to rise. They will revolt. They will oppose and they will uproot terrorism one day. The path is not easy. Thousands of these brave women will be killed, hanged, raped and tortured. But this uprising once it begins will not stop. The film shows that the thought process is already on. But there may be such rebels in Pakistan who are too timid to come out as yet. They are still extremely subjugated to speak out. But for how long will the selfish and perverted interpreters of a great religion keep them so? 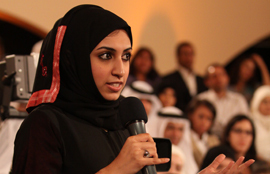 When we see programmes like Doha-Debate on BBC we see brilliant women putting forward many progressive ideas. Hope lies here! This is not to deny the fact that misguided by these so called “followers” some women have practiced violence, played human-bombs and lead to acts of terrorism. But these are exceptions. 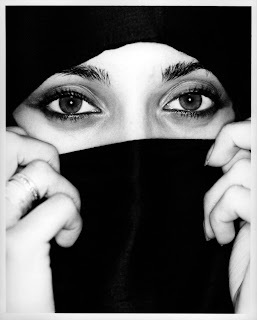 Confining themselves to the tenets of the holy religion, correctly and reveredly but not blindly interpreting these teachings, these women will show their men the way. They will tell them to stop. Men will do their best not to stop. They will even kill these women. But once the revolution gets sparked off no man can ever stop it. Once again I reiterate that these women masses will remain strictly within the truest, noblest and most sacred tenets of the great holy religion. They will be falsely painted as disbelievers but all this will fall by the side. Only these women will show what that great religion and the great teacher actually taught and what his teachings actually mean. No amount of American antiterrorist wars, no amount of policing or such violent means can ever end terrorism or similar perverted interpretation of the religion. A massive sweep from a non-violent assertion of women of Pakistan in particular and this entire subcontinent in general will end the menace. It will not happen in one life time. It will not happen in 100 years, it may take 200 -300 years. But it will happen. 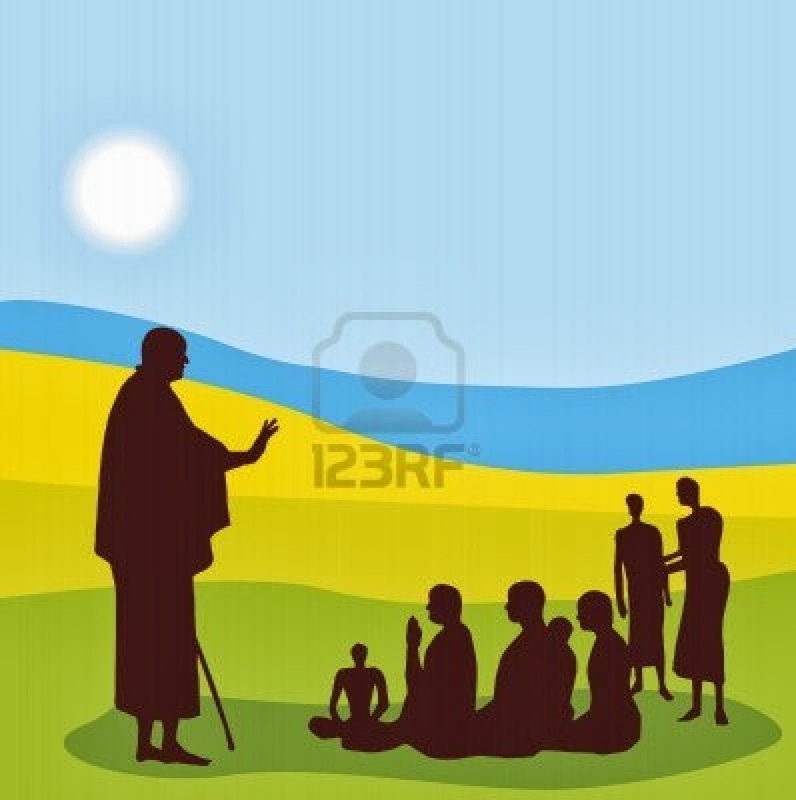 Swami Vivekananda has said “You educate a man - you educate a human being. 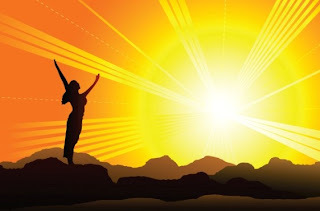 You educate a woman - you educate a human being, you educate the society, you educate the country” Enlightened women will do it what mighty armies and massive bombings can’t. When I don’t know – but there is a hope. 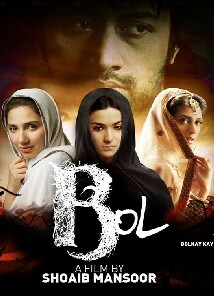 The film Bol has shown that hope. S. Irfan Habib (Historian of science n modern political history based in New Delhi. Latest book Jihad or Ijtihad:Religious Orthodoxy and modern science in contemporary Islam, New Delhi) tweeted this on the blog: Must say u were quite prophetic and can only wish that women will succeed in reversing the madness n lead the region into sanity. Arshad G Moh'd commented this on the blog on Facebook: Thanks Pankaj bhai for sharing your blog. Your words indeed are prophetic. It's important that Malala survives - if for no other reason then just to keep the hope alive. The hope that the killing of innocents will stop. The hope that subjugation and denigration of women will cease. The hope that women's and children's rights will be universally honored. This fourteen year old, in that sense, has achieved much more than what the 'grown ups' could. She truly epitomizes hope for the sub-continent. Jyoti Daswani commented this on the blog on Facebook: Brilliant! I particularly liked the contradictory states you mentioned,wherein such rebels arise. There was a complete chaos in the classroom. It was our second MBBS undergraduate lecture room. As we waited for the teacher to arrive and start the lecture expected disorder, fun, frolic, noise and mischief ruled. Absolutely neglecting the fact that there was a classroom adjoining ours, the entire class of more than hundred students was having a free for all. The other day I went for a haircut. Seated on the chair next to mine was a child of about four years and hovering around him was his mother. I was amused to see her continuously instructing the hairstylist as to how to cut and with what instruments. Just as the stylist moved she would move around the head of the child, supervising each and every strand of the hair getting styled. I could obviously feel the discomfiture of the stylist who was struggling to balance his work with the incessant instructions of the mother. Little did I realize that the child too was getting uncomfortable till he loudly shouted: “Mama you please go”! A hush fell in the salon but the mother – a cool cucumber just asserted “You don’t understand anything. 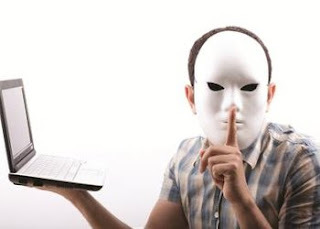 You just keep quiet and let me do my work!” The child was obviously bullied to silence. 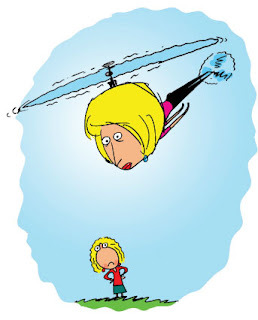 That was a helicopter parent in full regalia - a classic example of what Time magazine once described as "Over Parenting"